A few weeks ago, I was asked by Alison L. James, a Healing Facilitator and author (check out her new book on Merlin) to do a portrait of Merlin. I found that in order to tap into Merlin's magical energies, I needed to adjust some things: I had to be in a relaxed and happy state; my environment had to be calm; I had to loosen my preconceived notions of Merlin and I had to be open to wherever the picture took me. After several tries, we found an image that suited us both. Like most works of art that come through me, I have no idea how I did this! Enjoy the painting and be sure to watch Alison's interview on The Bridge of Truth below. Video created and produced by Al Leone for "The Bridge of Truth." For show updates, as well as past broadcast archive, click on the above link. 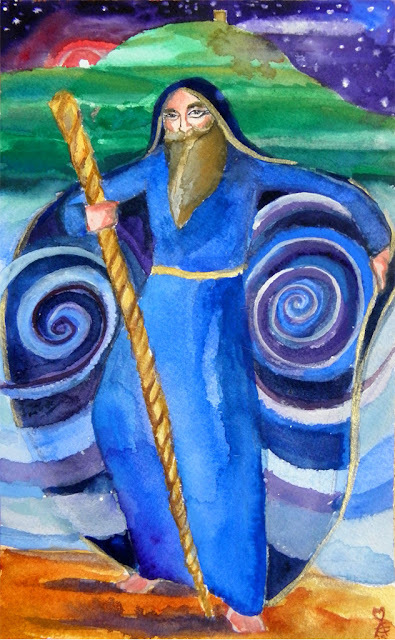 To order a print of "Merlin's Cloak," go to my shopping cart or contact me.